Our three Star Clippers sailing ships take 170 to 227 passengers - small enough to visit ports unreachable by large cruise ships, yet big enough to offer superb dining and onboard amenities. These are true clipper ships of the new age of sail - blending the romance of the legendary era of sailing ships with the comforts of a modern cruise vessel. Royal Clipper is a five-masted sailing ship, with 42 sails - the largest square rigger in service. She offers the ultimate sea-going experience with the superb service, amenities and accommodations of a fine modern yacht. Identical twins Star Clipper and Star Flyer offer the same polished brass and gleaming brightwork, with teak decks to relax on or watch the crew raising the sails. All Star Clippers' ships feature an elegant dining room with open-seating meals prepared to high culinary standards, an indoor-outdoor bar, and a library. The no-jacket required dress code guarantees the informal nature of a Star Clippers cruise. We offer Star Clippers cruises as a cruise-only option or as a package to suit your personal requirements - whether for anniversary, honeymoon, or as one of the best holidays for ultimate relaxation. 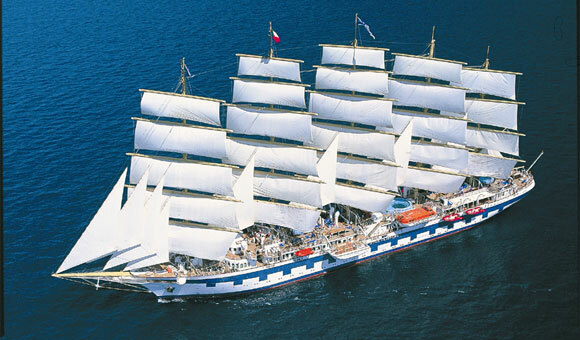 Go direct to the Star Clippers Sailing Cruises!